NOTE: Figures in parentheses are estimated actual distances, when markers are in non-standard locations, erroneous, etc. BEEN THERE, DONE THAT: I had lunch at Friday's Front Row restaurant on August 2, 2010. This gaudy jewel is certainly unique, in many ways. It is the only enclosed stadium in which the roof panels are arranged in a fan shape, which actually makes a lot of sense when you consider the acute angular layout of nearly all baseball stadium grandstands. This design results in a sizable amount of "dead" space at the extreme ends of those roof panels, behind the upper decks. The Brewers franchise offices occupy the space beyond the right field corner, and several conference rooms occupy the space on the other side. Because of its wide "footprint" and daunting sky-high ceiling, Miller Park is said to feel less intimate than its predecessor, County Stadium, even though it has about 11,000 fewer seats. The overall fan shape gives rise to several distinctive features, such as the huge glass paned window beyond the outfield and behind each wing of the grandstand. The outfield fence includes seven angles, most of which are too minor to have much effect on play, and which are in any case contrived. Much like Rangers Ballpark in Arlington, foul territory is very cramped, with long flanges in both corners, especially on the right field side. The way the upper deck gets bigger toward the foul poles is reminiscent of Chase Field, another retractable roof stadium. The symmetry of the overall structure likewise constitutes an exception to one of the basic criteria that define the neoclassical stadiums. About the only design features that really make it fit into that category are the brick exterior and the clock tower. The gargantuan roof itself is worthy of extensive discussion. Its apex (on the outside) is 330 feet above field level, nearly as high as the distance down the foul lines. The roof has seven wedge-shaped sections, two of which are permanent and five of which pivot in back of the upper deck behind home plate. Note the two support columns in that area shown in the diagram above. The "Bob Uecker" seats behind them have a partially obstructed view and are sold at a discount. Also note in the diagram that the arches account for the varying height of the roof. 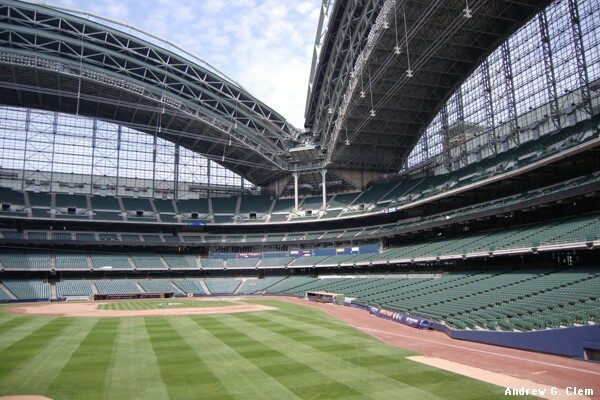 Three roof sections rest on the left side of Miller Park when the roof is open, and two rest on the right; the arch of each successive section is higher than the previous one. There are four support columns for the roof arrayed along the outfield perimeter, and the "bulge" in center field (which at first glance seems odd and contrived) was put there to accommodate two of those columns. Built just to the south of where County Stadium used to stand, Miller Park was originally scheduled to open in 2000. Construction was delayed for several months, however, after the huge crane was blown over by high winds. Three workers were killed in that tragic accident. It took a few years before the Brewers had a winning season in their new ballpark, but they finally established themselves as a competitive force in the National League. They even won the NL wild card slot in 2008, but advanced no farther in the playoffs. One very positive sign is that attendance has climbed steadily, currently averaging in the mid-30,000 range, and for the past four years has ranked eighth or higher among all National League clubs. Milwaukeeans were rightly proud to host the All Star Game in 2002 -- the first time since 1975 -- and expectations were high. The gala event was spoiled, nonetheless, when Commissioner Selig declared the game over even though the score was tied, because both teams ran out of pitchers in the extra innings. To rectify that monumental goof, MLB officials changed the rules so that the winning league's team got home field advantage in the World Series, making sure that the 2003 All Star Game counted. At least something good came of that. # 5 ~ Monument honoring the Milwaukee Braves, in the north parking lot where County Stadium once stood. # 6 ~ View of the Home Plate gate, on the northwest; statue of Hank Aaron is at left. # 7 ~ Panoramic exterior view from the northwest, showing the scoreboard of Helfaer Field at the bottom. # 8 ~ Panoramic exterior view from the pedestrian bridge on the southeast side; note the yellow slide used by "Bernie Brewer." # 9 ~ View from the first base side, upper deck. Courtesy of Scott Rhodes, taken May 2015. NOTE: The diagram thumbnails have been continually replaced since 2008, so the images seen in the older blog posts do not reflect how the full-size diagrams looked at that time. Roll your mouse over the adjacent thumbnail to see a pre-2008 version. Have you been to this stadium? If so, feel free to share your impressions of it with other fans! (Registration is required.) Also, I welcome submissions of original stadium photos that fans have taken, and will make sure they get properly credited. Just send me an e-mail message via the Contact page.